The final design goal is to align the cartridge correctly with the record groove, recapitulating the position of the stylus on the cutting lathe. The first alignment for all pivoting arms is bending the tube at some point(s) along its length to maintain the correct tangency between cartridge and groove. (In geometry, “tangent” means a straight line touching a curve at one point.) A pivoting tonearm will be perfectly aligned with a concentric recording groove only at two points in its journey from rim to center, but with care an overall accuracy of ±2 percent can be achieved. When you’re trying to impress friends, give them a choice center cut off your favorite LP, where deviation will be the least. The equations for calculating the optimum arm length, offset angle for cartridge mounting, and the arm’s mounting point on the plinth have been well established for over 40 years. Generally, the optimum compromise for arm tube length is 9 inches, with the cartridge offset by about 25 degrees to the line of the arm. 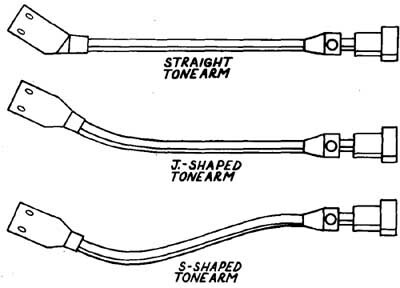 Arm tubes come in a variety of shapes: straight, S-curve, double S-curve (a Joe Grado special), J-curve, and undoubtedly new ones yet to be dreamed up in the search for ideal tangency. Straight and J-curve arms, which maintain tangency by angling the headshell on an otherwise straight tube, require less material than do S-curves and therefore permit a lighter (lower-mass) arm. Arm tubes that taper, regardless of configuration, stagger any buildup of resonance, because the tube’s diameter changes, so does the resonant frequency of the tube. Resonances can be more readily propagated with untapered arms because the tube’s resonant frequency remains constant over its entire length. Aluminum is often selected for its lightness and strength; alloys of magnesium and titanium have roughly the sane strength but will resonate at different frequencies. However, the choice of tube material is generally less important than the mechanical design and execution of the tonearm. Offsetting the angle of the cartridge on the arm to maintain groove tangency also introduces a bias or skating force. Left uncorrected, the inner (left-channel) groove would have much more force against it than the outer groove, resulting in degradation of imaging and, in severe cases, nasty distortion, as well as uneven record wear. The antiskate adjustment can partially counteract the cartridge’s “inward pull” on the arm. However, skating force varies with the music’s loudness level, since it is a function of the stylus drag and cannot always be perfectly balanced by a constant antiskate force. The most serious problem with this skating force is that it dislocates the alignment of the cantilever respective to the generator and the groove. This is one of the advantages of a straight-line tracking arm. Good tonearms make it possible to swivel the cartridge in all three planes—cartridge overhang and null-point alignment sets the lateral tracking angle, vertical tracking angle (VTA) adjusts the stylus vertically in the groove form back to front, and azimuth establishes the stylus at right angles to both groove walls to ensure proper right and left channel separation. Much more about this in “System Setup”. Precision adjustments for vertical tracking force (tracking weight) are also vital. A movable counterweight on the arm tube behind the pivot point adjusts the tracking weight or amount of downforce on the stylus riding in the groove, and counterbalances the weight of your particular cartridge.